'The Jester's Court' is the sixth solo album from Savatage/Trans-Siberian Orchestra guitarist Chris Caffery. In the many years that I've been a Savatage fan, Caffery was always the one that made sure the term "Metal" was close at hand. For this new release he's roped in Brian Tichy on drums and an assortment of TSO buddies on keys and bass, as well as Alessandro Del Vecchio. Musically, Caffery doesn't stray far from his previous work. The opening one-two bombast of the monstrous 'Upon The Knee' and '1989' pin the colours firmly to the mast. It's classic "Street Metal", the kind that Savatage used to do so well; 'Upon The Knee', in particular, is a magnificent, bruising powerhouse just made for the stage. The slower, yet no less heavy 'Lost Tonight' really should have been on a Savatage album – period! It's exactly the kind of multi-faceted track that Jon Oliva and Paul O'Neill used to do so well. I swear I could hear Zach Stevens singing 'Magic Man' in my mind, and if Savatage recorded a new album, this would certainly be on it. 'Protect My Soul' is an eclectic number, with Honky-Tonk piano and acoustic guitars in a "Gospel-meets-Folk-meets-rocking" charismatic "service", interspersed with some rather tasty Caffery soloing, and all going on in a backwoods church in deepest, darkest Louisiana. 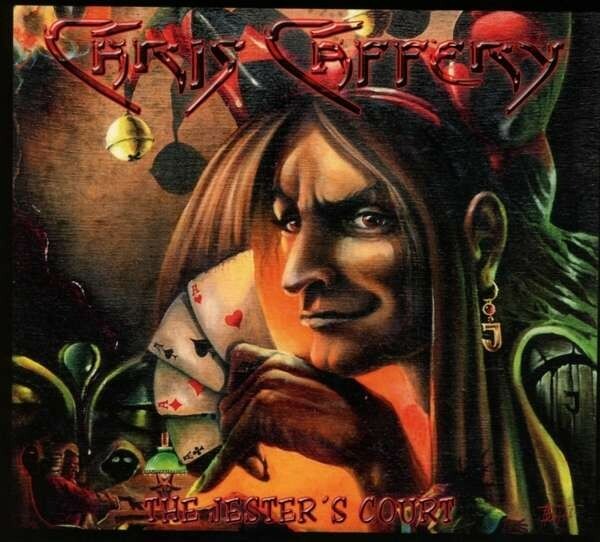 There's a big fault with this album and, to be honest, it has been crying out to be rectified for almost twenty years; that's the fact that Caffery does not possess the voice of a top-notch Metal vocalist. Yes, he can get away with one or two per album, but despite his best efforts, the simple truth is that 'The Jester's Court' is an also-ran, even before it gets the chance to actually run. Vocally, it's obviously to Caffery's liking, but to the average fan, you would need to be deaf not to hear how grating it really is. I have loved Chris Caffery's work for thirty years, and as a guitarist and backing vocalist for Savatage he simply kills it, but as lead vocalist he simply does not. If this album had someone like Roy Khan or Stevens involved, then we wouldn't be talking about what a let-down it is vocally, but possibly an album that would be in contention for "Album Of The Year". I'm sure I'm not the only one coming to this same conclusion – disappointing.